Jean Guichard: I think it's just because it's the best school. First, it is the oldest school. It was opened in 1946 by Jean Carles. At that time, people were working in Grasse with a Master, and Jean Carles thought that was not right, so he tried to think of a way to teach people, because he was very open, very generous and very helpful to young people. Very quickly, he had a group of people around him asking him for advice. And one day, they decided to open the Givaudan school. And then, a lot of successful perfumers came out of the school. We say that one-third - and it's probably more than that - of all perfumes created in the world have been made by people trained at Givaudan. And so that's why the school is famous. But today, our competition - people like Firmenich, IFF, Symrise - they see that it is interesting for a company to have a perfumery school. And now they're trying to open schools. For example, five years ago, I was saying to my students, "We are the only perfumery school." Today people say, "But I've got a friend working with Firmenich, where there's a perfumery school." But you know, we also have the past. For example, people like Jacques Polge from Chanel was trained at the Givaudan school, Thierry Wasser at Guerlain, Jean-Claude Ellena. And if you look at our competition, IFF has Dominique Ropion. Firmenich, Symrise, they have 4 or 5 perfumers who were trained at our school. We say that what makes a good perfumer is not the school or the training, but the quality of the students that we take, and they make the school famous. Persolaise: Do you still use Jean Carles’ original teaching methods? JG: What we use very much is the method of learning the raw materials. Of course, we use the principles of Jean Carles, but we change the products, because every year, we've got some new molecules. But the principles are the same: learning by contrast and then by families. P: Would it be true to say that, no matter how much you teach somebody about raw materials and ingredients, perfumery essentially comes down to mixing together various substances and seeing what happens? Trial and error plays a massive part, right? JG: Well, errors can happen, but then you've got to have somebody who can say, "Well, I don't know how it was made, but I like it like that." We have several examples of that. For example, Poison from Christian Dior. We were working on the project. Dior was managed by a man called Maurice Roger. He was very busy, but he thought the choice of the perfume was too important to delegate to somebody else. So he wanted to be part of the selection. But he was difficult to meet. So we worked during the week, and on Fridays, we selected two or three experiments and we sent them to him. He would smell them during the weekend and he called back on Mondays, telling us what was wrong, so that we knew what to do during the week. And one Friday, it was spring time, we asked the lab technician to get two samples ready. She sent them to Maurice Roger. When we smelt them at home, they were not our perfume. Overall, they smelt very bad. Very synthetic, very fruity, horrible. When we went back to the office on Monday, our management was waiting for us, saying, "What have you done? What did you send?" And we had to admit that we'd made a mistake. So they said, "Ok, phone Maurice Roger and explain to him what's happened." So we phoned, and we explained. And I remember he didn't react. So we didn't know if he'd had time to smell our samples. So we corrected the perfume, and it smelt very nice, and we sent it to him. Then he called us some days later and said, "The new sample is not good at all. But the old one, the one you gave me last weekend, was fantastic." So we had to find out what had happened. It was the mistake of the lab technician. At that time, there was some damascone in Poison, alpha, beta and damascenone. The perfumer who was working on the trials was Edouard Flechier, and he was using those products at 1% concentration. The lab technician forgot about the 1% and added them at 100% concentration. But what I mean is that it wasn't the lab technician who made the perfume. The important person was Maurice Roger, because he chose it. P: What does the future hold in store for us as far as raw materials are concerned? For instance, are you on the verge of finding an amazing, synthetic lily of the valley? Hervé Fretay: As you can imagine, that's an area of strong research. And it's a bit of a Holy Grail. P: Please hurry up and find it. HF: But it's like the Holy Grail! We're lucky, because within Givaudan, and with our past, we're very strong with lily of the valley creations. We were the inventors of lilial, we invented bourgeonal at Quest... we've already got a good palette of specialties in that area. And florals are really at the heart of what we do, because florals are at the heart of perfumery. JG: Methyl pamplemousse is fantastic. It smells a bit like grapefruit, but it's a molecule invented by chemists, not taken out of a grapefruit. It's very important in Terre D'Hermès. HF: Yes, Jean-Claude Ellena likes it very much. And the new age of methyl pamplemousse is paradisamide, which we released last year. It's a bit like grapefruit, but pushed more into the direction of tropical fruit. Brazilians love it. It's guava, grapefruit, a bit of cassis. There's also a new molecule called karmaflor. 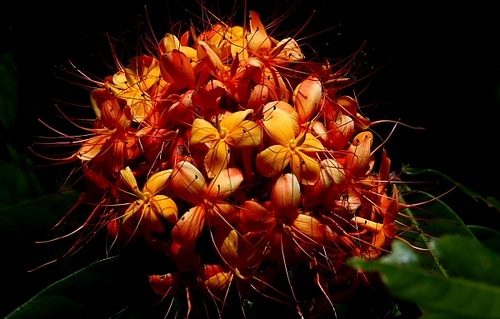 It's a unique molecule that we identified in a tropical flower from India, called ashoka flower. The molecule was identified a few years back, but at that time we didn't have the technology to produce it at a decent price. But now we have it, and we have brought it to the palette of Givaudan perfumers one year ago. And it's a fantastic floral. It's a salicylate, and it gives a real floral density, like a tropical flower, like frangipani. And some perfumers in our fine fragrance team are saying that they almost see it like the hedione of the tropical flowers. P: What advice would you give to someone trying to teach themselves perfumery? JG: You cannot be a perfumer if you don't learn. Remember, when we take students, we keep them at the school for three years. And after those three years, they still learn for another two years, so that means it's five years to become a perfumer. So, if you're doing it just by yourself, I think it is very, very, very, very impossible. But yes... it's a starting point. P: And finally, what are your thoughts on the subject of anti-allergen legislation and IFRA? HF: You know, we are a self-regulated industry, so IFRA is a body which takes decisions on a common basis for all perfumery labs. We guess they're taking the right decisions at the right time. JG: If some of the products we use are bad for people, then we've got to stop using them, because we're not there to make people suffer. You know, to be creative means to invent, and to invent with what is around you. 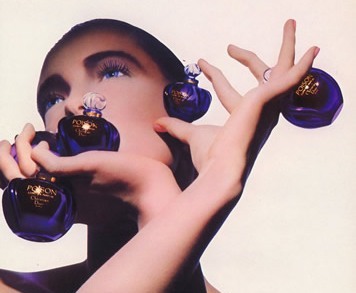 So if IFRA limits a product, or bans a product, a creative perfumer will invent what he can. But what's difficult is when you have an existing perfume and you have to modify it. But when we hear about a perfumer who is crying, "Oh, I can't make a good perfume because I don't have this raw material," we think it is just a lack of creativity. HF: And you know, restricting some ingredients helps perfumers to re-discover other ingredients in the palette. Perfumers can create really fantastic fragrances and they have re-discovered molecules that were just sitting there in the palette. P: But isn't the loss of classic perfumes a sad situation? JG: Yes, for some fragrances, like chypres. But then, because of the restrictions, we have what we call modern chypres, like Narciso Rodriguez, like Coco Mademoiselle. If oak moss was still allowed, we wouldn't have had these perfumes. HF: It opens new doors. JG: You know, when you look at a formula, you can tell when it has been created. A formula today is not the same as one from twenty years ago, or ten years ago. Why? Because some of the raw materials do not exist any more, and some other ones have been invented. So you've got to see perfumery as a moving work. But you're right, for existing perfumes, it's difficult to keep them in shape. My thanks to Odette Toilette for arranging the interview. Love this article, Persolaise ! Especially the Poison story - it's fantastic to know little treasures like that. I also loved the bit about the IFRA and and to learn the thoughts of Jean Guichard and Herve Fretay, on the restrictions. They are quite positive . Thanks. Mimi, thanks very much indeed. Yes, Guichard and Fretay were certainly very diplomatic about IFRA... and by that I'm not trying to suggest that what they said isn't true. What a great interview! My favorite part is Jean Guichard's note that great perfumes can arise as a result of restriction just as they can from excess. I've heard so many times that less is more with writing. It makes me optimistic that the same concept applies to perfumery. Joan, thank you. Guichard's comment about the valuable effects of restrictions is definitely true, in my view. But that doesn't help us come to terms with the destruction of so many classic scents. Anon, would you care to elaborate? I don't believe that Poison story, I read the other day that Dior saw over 800 samples for the perfume because this perfume was created by an open call, and the formula that won was Fleicher's and they mentioned it came from X company I don't remember right now but it wasn't Givaudan. There is no honesty in this industry. Ramon, thanks for your comment. The article above contains Guichard's words/views as he presented them to me. Perhaps if someone is able to offer an alternative take on the story, they might care to drop a line or two here.